A north-east newsagent has been targeted by thieves who made off with a “quantity” of high-value cigarettes. 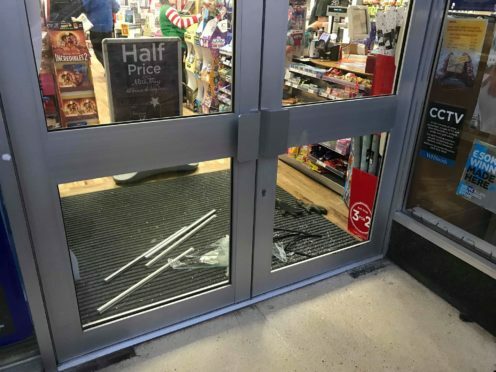 They smashed their way into the WH Smith store on Marischal Street in Peterhead at around 12.30am on Thursday morning. A glass panel on one of the shop’s doors was shattered and broken glass was scattered across the floor. Shop staff had to work around the shattered glass as repairs were carried out. The window has been boarded up. John Pascoe, the chairman of Rediscover Peterhead, said he was worried that such incidents had a negative impact on the community. He said the group, which is working to improve the town centre, is planning its own CCTV scheme to boost security. Mr Pascoe said: “We are concerned about the current number of thefts and break-ins to town centre businesses in Peterhead. “Running a town centre business has many, many challenges and losses, due to theft, is another serious issue that these businesses could do without. Police said their inquiries are continuing and have appealed for anyone with information to come forward. PC Josh Kinnaird confirmed the cigarettes were taken during the early morning raid and has asked locals who saw anything to contact officers. WH Smith could not be reached for comment. This is the second time in less than a month that the shop has been targeted with an alleged raid taking place on November 8. Packed Poppy Scotland tins were said to have been taken following the apparent break-in. A 27-year-old man was subsequently charged in connection with the incident. John Paul McCormick appeared in court and made no plea or declaration. Poppy Scotland said it was “appalled” that money used to improve the lives of veterans had allegedly been taken.